Making changes to your business’s fulfillment operations is an important step. Whether you are upgrading from an in-house logistics team or switching to a different fulfillment company such as Promptus, making a smooth transition is important to ensure that your business operations don’t suffer in the process. At Promptus LLC, we see clients that have made the decision to move their fulfillment operation for various reasons: to accommodate higher demand, for better customer service, to save money, or simply to trust the experts to handle shipping requests. 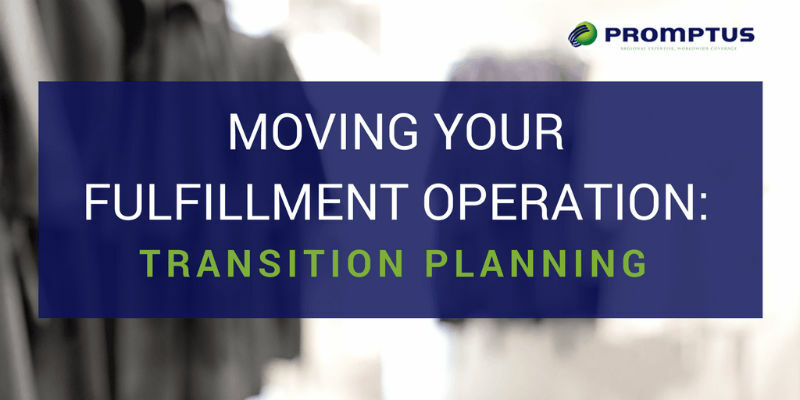 Regardless of the reason, we understand that making the change to your fulfillment operation is no easy task – which is why we have written down these steps to help your business transition to our facility as smoothly as possible. Whether you are a small mom-and-pop or a large business, a disruption in logistic services can negatively affect operations and profits. When making the switch to a new logistic fulfillment company, the most important thing is to communicate what you need and ensure your new company can meet those requirements. As a global logistics provider that has been operating for over 15 years, we have a number of resources at our disposal to help initiate a smooth transition. The first thing you’ll need to do is develop a full assessment of your fulfillment operations including inventory requirements, storage needs, delivery options, package and assembly processes, special product handling requirements, replenishment lead times, and more. At Promptus, we understand that some business owners or operators may not fully understand their fulfillment needs, which may be why they are turning to a 3PL (third-party logistics) provider like us in the first place! We can help you develop a full understanding of your company’s fulfillment operation and what is necessary to support it. Discussing your needs with your prospective new fulfillment company is extremely important before you agree to make the transition. In addition to discussing what fulfillment services you will need and what fulfillment services they offer, you should inquire about their provider systems and reporting capabilities. If you wish to keep your programs or fulfillment systems, you will need to verify that your new company’s systems will communicate successfully with your own. For example, you can schedule a consultation with one of our experts to learn more about our team and what we offer. You can give us an idea of what your business needs and we can provide a number of options that may be suitable for you. From there, you can take your time to assess if Promptus is a good match for your business before getting back to us! Remember, the goal is to avoid any unnecessary hiccups or delays in business transactions during this transition. After all, finding out at the last minute that your new fulfillment company’s inventory reporting program does not work with your current distribution software can seriously impede your workflow. One of the most important aspects of any company’s operations is their customer. When talking to a possible new fulfillment company, discuss their shipping and delivery options. Do they offer freight forwarding or will they be partnering with another provider? Regular and new customers alike expect their goods and products to arrive in a timely and reliable fashion. But don’t stop there – take the extra mile to ensure distribution and carrier services offer flexible and affordable options. Clients will appreciate shipping options like expedited or insured. Take the time to talk to your client base or go through records to determine what your customers like best and what you may benefit from offering. Just as it’s our job to keep our clients happy (AKA you! ), we understand that it’s your job to do the same for yours. As you can see, the trick to ensuring a smooth transition process when changing to a new fulfillment provider is thorough planning. If you are completely aware of what you need and exactly how it will be executed or implemented, you can reduce the possibility of slip-ups or expected troubles. If you are considering expanding your fulfillment operations, including inventory management and storage, international shipping services, and more, contact us today. Promptus LLC has been dedicated to the logistics industry since 2001, and we are experts in warehouse and distribution, and offer our services from our headquarters in Miramar, FL to business around the world.